Today I have a special (and timely) treat for everyone! In honor of the beginning of the World Series I asked one of my best friends and fellow crafters, Katie, to share a fun redo she recently did. I have to say I saw the before and after in person and the photos don't even quite do the makeover justice that it does in real person. Thank-you, Emily, for asking me to share a true trash-to-treasure story! I must say, I am excited to be documenting the re-birth of an... ummm... shall we say distressed... piece of outside decor. 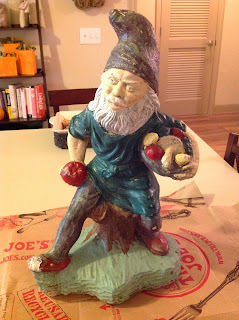 When my husband's brother moved into a new home in Iowa, the previous owners left a garden gnome on the premises. I do not believe they left it in error but as an intentional way to pawn off an ugly and super heavy piece of backyard-tackiness. It has since become a tradition to pass this guy (named "Shamus") around to each family member as an unwanted gift. Just so I'm setting the scene right, you have to understand that everyone else in the family has a house and, appropriately, a garden to hide this creepy fella except Kyle and I. We live in an 800-sq ft apartment with no outdoor space. 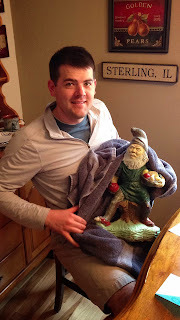 So to my delight **insert sarcasm** Kyle received the gnome for his birthday in April and we dragged this thing back from Kyle's other brother in Virginia to our home in Charlotte (Yes, the gnome was presented wrapped in a bath towel). I'll admit, Kyle is a gracious cohabitor of our tiny space. He doesn't voice many opinions about decorations or my homemade crafts like the block pumpkins, stair rail wood snowman or burlap wreath. 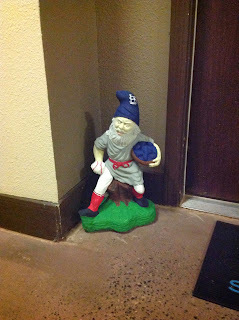 However, he was adamant Shamus the Gnome needed to be on display and insisted we place him outside our door in the hallway of our apartment building. I could hardly argue as this would relieve me from having to find a way to make him fit it in our actual living space. Our other hall tenants love Shamus. Chatter-box Kristina across the hall says she waves to him every morning. This summer we came home from vacation and found him a few doors down (not sure if he was moved or if he decided to take a stroll on his own). We have even heard rumors of a weirdo in another part of our building mumbling to himself about trolls. We like to think he saw our gnome and it sent him into a psychotic dialogue about little men. He has become a part of our small entryway and after 6 months of greeting Shamus every time we came home, I decided to take matters into my own hands and give him a makeover! 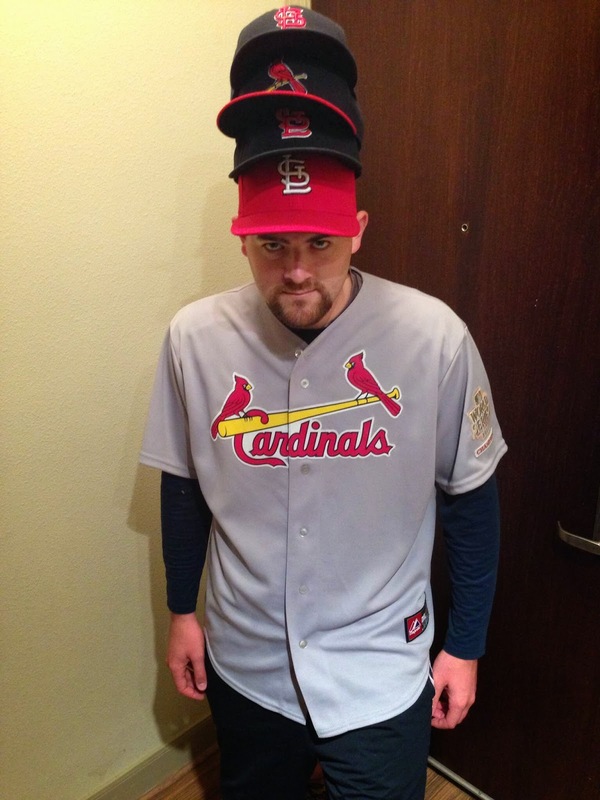 On a related note, Kyle is a HUGE St. Louis Cardinals fan. Huge is an understatement. He can usually be seen with at least 2 pieces of STL Cardinals gear on at all times. See Exhibit 1. As the Cardinal's season continued and their hope of a postseason stint seemed imminent, I formulated a plan to turn Shamus into a Cards fan, keeping with the This-Is-Kyle's-Decor-Not-Mine theme. It took an entire afternoon, some cheap paint and a lot of patience waiting for the layers to dry but I am thrilled with how he turned out! Here is a close-up of his look prior to some T.L.C. The whole project cost just a few dollars since I only needed to get a couple extra paint colors I didn't already have on hand. I used Folk Art Acrylic Paint which doesn't make him weather-proof but that can be someone else's problem one day when he gets passed on. After a quick wipe-down to remove dirt from Iowa, Virginia and who knows where else, he was ready for his first layer of paint. Since I used the cheapest paints available it took many layers (3-4) so I moved between different colors and sections while the previous area dried. I mixed shades of black, white and gray to give his beard some depth and even made his lips a more realistic pink by diluting red paint. I free-handed the STL on the hat with a pencil, copying the logo from one of Kyle's many baseball caps, then painted over the pencil marks with short strokes and a very thin paintbrush. The apple in his right hand was the perfect shape for a baseball (credit goes to Kyle for this idea), but I was unsure how to utilize the lumps and bumps of the basket in his left arm, so I painted it dark so your eye isn't drawn to it. Everyone in Kyle's family approved of the makeover and I think he is now somewhat desirable! He has brought good luck to the Cardinals team as we now pat his head on game days before entering our apartment. 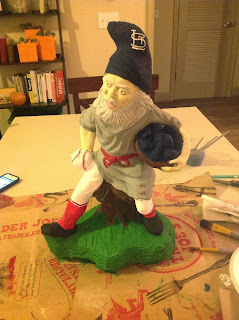 You don't think our gnome is the reason the Cardinals are playing in the World Series tonight? Go ahead, be skeptical, but in a sport riddled with curses and traditions I'm giving credit to Shamus for at least a small part of the Cardinals' success. I hope you have been inspired to give an old piece of decor a boost and make the best of an otherwise ugly and creepy situation. And while you're at it, join Kyle, Shamus and I in cheering on the Cardinals as they look to beat the Red Sox and win the 2013 World Series! Thanks for sharing Katie! Hope Shamus continues to bring the team luck. So if you find a garden gnome in need of a makeover you have some true inspiration now!